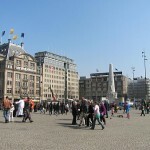 Dam Square can from a touristic point of view be called the “centre of Amsterdam.” At this important square you can find attractions, museums, shops, restaurants and it is easy to get around from here. 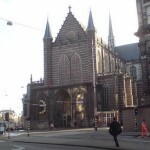 It is less than 1 kilometer from the trainstation to Dam Square, so for people coming with train to Amsterdam it is easy to get to this square. 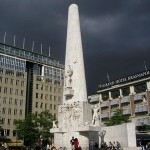 The most important buildings on the Dam Square is the Nieuwe Kerk (New Church), the Royal Palace, Madama Tussauds wax museum and a white monument in the middle of the square in memory of those killed during II World War. 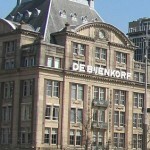 Besides these important attractions, Hotel Krasnapolsky can be found at the square, and so can De Bijenkorf, a department store with luxury products.